STOP HS2 | Over budget HS2 contractors “running their own gravy train”, with average 86% overspend. Over budget HS2 contractors “running their own gravy train”, with average 86% overspend. Whilst the budget for professional services contracts on Phase 1 of HS2 was originally set at £101m, the total spend on these contracts up to the end of February this year was £188m, 86% over budget. Of the 16 ‘professional services’ contracts, every single one is over-budget, leading to criticisms that consultants are “running their own gravy train”. 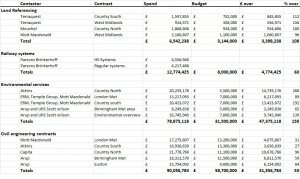 Building.co.uk uncovered the figures as a follow up to an investigation to HS2 costs they conducted last November. Back then, they discovered that the Civil and Structural Design Services contracts were running 18% over budget. This figure has now risen to 53%. Railway systems contracts are 60% over budget, whilst land referencing and environmental services are both over double their estimated costs, at 108% and 150% over-budget respectively. Full breakdown of contractors overspend, as of February 2014. Click to enlarge. Despite this fact, a HS2 spokesperson told building.co.uk that HS2 “had so far been delivered within its overall allocated budget for the project” and the company was “on course to remain within” this budget for the current financial year. They went on to say that the consultants had helped “produce a scheme that has an implacable approach to environmental mitigation, with the correct balance of engineering design”. This of course hardly tallies with the fact that HS2 Ltd recently admitted to the Commons Environmental Audit Committee that they had not even surveyed 40% of the route and there ‘may have been omissions’ from their ancient woodland directory. The Woodlands Trust state that HS2 Phase 1 will go through 27 ancient woodlands, 8 more than HS2 have admitted to. In fact it was the completely inadequate environmental work in rural areas which was responsible for the biggest overspends. 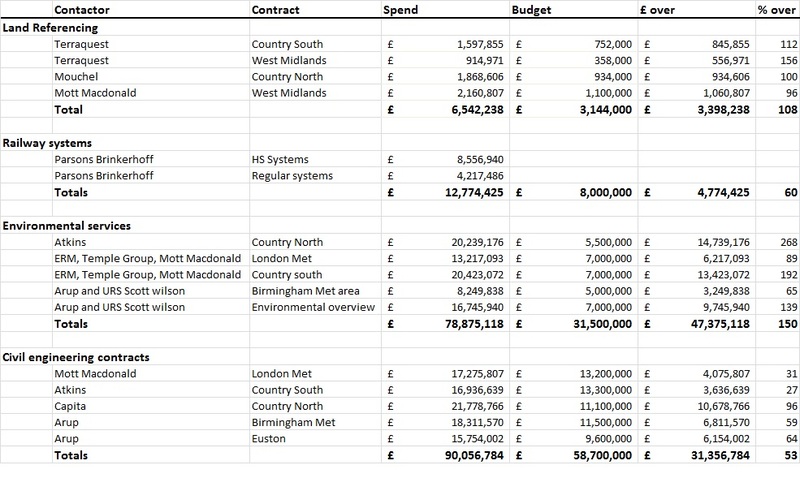 The biggest overspend on a single contract was for environmental impact assessments on the line in Warwickshire, Solihull and Staffordshire coming to a cost of £20.2m, almost four times its original £5.5m budget. The rural area south of this covering Northamptonshire, Oxfordshire and Buckinghamshire was not far behind, coming in at £20.4m, against an original £7m budget. The lowest overspend was ‘just’ 27%, whilst six contracts are currently over double their original budget. “The consultants engaged on the project know that Parliament has allowed the Department for Transport an unlimited budget to spend on high speed rail. They also know that this a project the government are determined to push through, whatever the costs. It is up to the Department for Transport and the Government to ensure consultants keep to the budget allocated to them, but clearly they are failing on this. “Total cost of HS2 will be over £200 billion” claims MP. Pingback: STOP HS2 | MPA Annual Report claims amber-red status represents ‘significant progress’. when the debates were on. Quite right but I doubt very much that they made their choice based upon whether or not HS2 was in the manifesto. More of the same from one of the loudest (and rudest) pro hs2 supporters! Well spotted and have you even considered the rationale behind such sentiment – could it be that HS2 (for the vast majority of the UK electorate) is a matter of very little concern to them? If that conclusion (backed by evidence provided by proven voting behaviour?) is correct, what does it say about the likely outcome in 2015 – more of the same perhaps? Sorry to appear rude but I just can’t help myself sometimes; pointing out inconvenient facts? It is interesting that you feel that the electorate had a public vote because HSR is in a party manifesto at General election time. You may be right that at the time a lot of people probably just voted the way that they always do and I would venture to suggest that a large number of people would have seen that the route was nowhere near them and breathed a huge sigh of relief and voted the same way that they always do. That is not really a public vote now is it? Also, as is your usual approach to this topic, you sidestepped the issue which was the overspend about which Tim Guest I think was suggesting that a review was in order followed by a referral to the public. Do you not have a comment to make about the overspend? I am sure that we would all like to hear how any PRO-HS2 person can justify that when the project is not properly underway. To finish with, the rudeness to which I was referring was not in your response to either Mr Guest or to me but is more generally plastered about over many other sites. Oh well each to their own approach I suppose. For the avoidance of any doubt, HS2 was not mentioned in the last Conservative party manifesto. There was a reference to a High Speed Network. High Speed is defined as 125 mph speeds for existing ( upgraded ) railways. Therefore large sections of both the WCML and ECML do meet that definition. Oh dear,KNC, here we go once again- on a technicality! As I have tried to point out before -125 mph- which is the nearest equivilent to 200 kph -is the MAXIMUM permitted speed when trains are controlled by conventional colour light signals, whether or not the train is able or designed to go faster. In practice,in the UK trains seldom maintain this speed for any sustained distance, even if they may reach this speed. Drivers are expected to operate WITHIN-i.e. generally BELOW- this top limit and the scheduled timetables are framed to allow this. And if a driver were to ignore this, apart from the risk to his job, the train would probably be delayed by signals further on, especially on the fast and frequently congested main lines. Unlike the roads, the traffic on the railway is regulated and controlled..it’s not a free for all…which is why a train weighing several hundred tons and carrying several hundred people can still travel safely at nearly twice the maximum legal (and frequently abused) road speed limit -but only on those sections of line that are appropriate. HS2 already over budget without the first sod having being cut. Stop this before it gets any further out of hand, this should be put to a public vote. At the last General Election in 2010 – more than 98% of votes cast supported parties (which included UKIP) carrying a commitment to High Speed Rail in their manifesto – the outline route of HS2 (phase 1) was also in the public domain at that point. In 2015 the public will have its chance to renew or abrogate the existing mandate. Please stop trying to confuse matters – in the UK individual policies are NOT subject to referendum, only issues of constitutional import. I am very surprised to hear our friend from Alderley Edge imply an electorate mandate for HS2. One or two others have tried from time to time, but I haven’t heard it from Padav before because he knows the claim doesn’t stand up to scrutiny. I will repeat that the Conservative manifesto did not refer to HS2 nor any possible route. It referred to a High Speed Network and since the definition of that for existing lines is 125 mph – a requirement that is already met by large sections of both the WCML and ECML — the manifesto could just as easily have been interpreted as meaning existing lines would be upgraded. Worse than that a series of Conservative voices were suggesting that they would scrap the project. As an aside the cost of HS2 is generally regarded as having risen by more than 50 % since the election. As far as UKIP goes at least they have seen the error of their ways. It is also worth pointing out that regular opinion polls have shown more people against HS2 than for it, with a majority of people preferring to upgrade existing lines. It is true that the UK only has referendums on very major issues but to claim an electorate mandate for HS2 is a bit like trying to claim that a vote for a party that says it will reduce the deficit means a vote to impose an 80 % top rate of income tax on “professional facilitators” based in Chesire. More wishful thinking on your part I’m afraid – why don’t you run your idea past a senior member of the Conservatives and see what they think of your interpretation? Opinion polls on HS2 are routinely commissioned by the anti-HS2 community – and surprise surprise they come back with a negative response – did you really expect anything different? You clearly misunderstand (or wilfully choose to ignore) how political discourse functions in the UK’s representative democracy – at present HS2 boasts a clear electoral mandate, whether or not you like it. It is for campaigners such as you to persuade the British public that HS2 represents such a massive issue that they must vote against any party carrying a commitment to it in their 2015 manifesto. So let’s wait for the 2015 General Election results to come in and then make a judgement? You have to wonder how he finds the time to respond across the country’s news media to any argument in which he sees an opening for a niggling counter attack but seldom hangs around when faced with a few facts. HS2 is not a network and it is in no way possible to ‘integrate’ its 350 miles into the existing 10k miles of route / 20k miles of track to improve the network overall.